This post is going to be a bit different today. My friend Valissa, who is also an amazing esthetician at AE SPA (try the Signature facial for a relaxing and cleansing experience!) and I wanted to explore some Rochester hot spots that were on our radar for tasty meals and treats. We decided the best way to do this, was to create our own Sip and Savour food tour! When creating our course by course tour, we wanted to incorporate different types of cuisines and taste one course (appetizer, main course, palate cleanser, and dessert) at each location. On our list for this tour (yes, this indeed means that we will be doing this again! Send me an email or comment if you would like to join in on a future “tour”), we included The Red Fern for our appetizer, McCann’s Local Meats for our main course, Hedonist Artisan Ice Cream for our palette cleanser, and Upper Crust Cakery/Glenn Edith Coffee Roasters as our dessert. The idea of creating the course-by-course food tour, was not only to have a girls day with amazing dishes to munch on, but also to get to know each of the chefs/owners better, right in their own element of cuisine! We had already decided that we would begin with appetizers at The Red Fern. However, when we looked at The Red Fern’s special posted on Instagram for the day, we not only knew that this would be our choice, but that we also made the right choice! 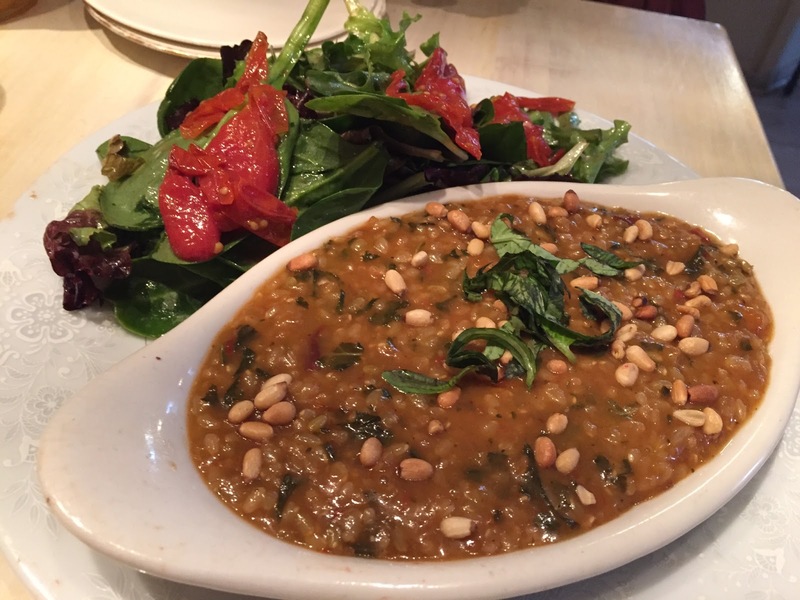 The special of the week was a Sun-dried tomato brown rice risotto with basil and toasted pine nuts (yum!). It was accompanied by a greens and roasted tomato salad that was perfectly dressed with a crisp and light balsamic. It added the perfect compliment of flavor to the heartier risotto. We also were intrigued by the quesadillas. We had both never tried vegan sausage or vegan cheese and decided that this was the dish that would be our first experience. Boy were we right on in choosing the quesadilla! Its crispy shell was perfectly charred and added a great crunch. We honestly could not tell the difference between a vegan and non vegan Italian sausage! It was seasoned perfectly and flavorful. 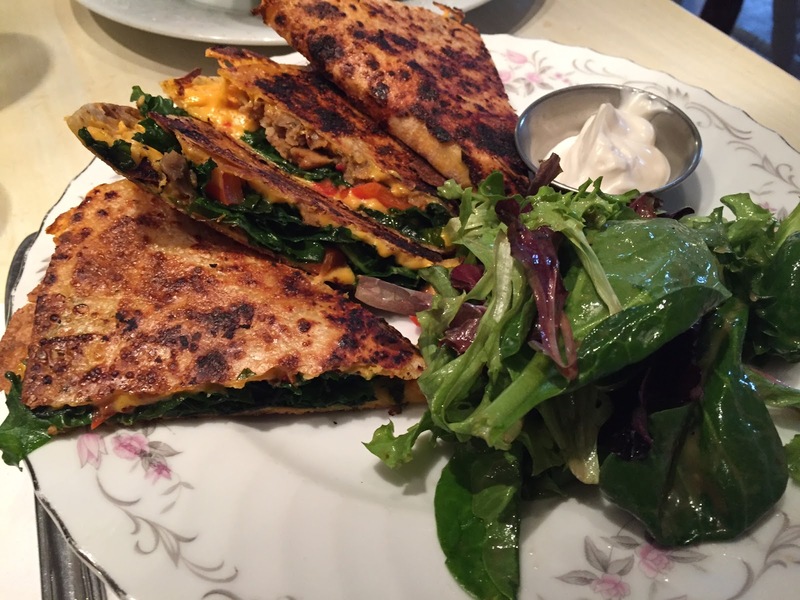 The vegan cheese was creamy and added that traditional melty gooeyness that we all look for in a perfect quesadilla. (On a side note, The Red Fern holds vegan cheese making classes that take place about once a month at the Rocbrainery -another favorite spot of mine!) The classes sell out very quickly, but you can learn more about vegan cheese making from the Andrea Parros, owner herself!) After our meal, Andrea, the owner of The Red Fern, came over to our table and we chatted for a bit as we told her about the amazing start to our food tour! The food at The Red Fern is flavorful and enticing. There is a clear creativity that is sourced throughout the menu. After The Red Fern, we headed over to McCann’s Local Meats, which is quickly becoming a favorite spot of many. Their open floorpan offers a complete perspective of the expertise at McCann’s Local Meats. McCann’s prides itself on local, ethical, and sustainable meats, that never contains growth hormones or preventative antibiotics. With the increase in awareness of where our food comes from, McCann’s celebrates the authenticity and responsibility that we as consumers look for. McCann’s is frequently packed with people and we began immediately by browsing the menu, so that we were prepared when it came our turn to order! We easily settled on the banh mi special with a side of japchae, which is a Korean dish with translucent sweet potato noodles and sautéed vegetables. McCann’s japchae included tender pieces of beef. I have had banh mi a few times, which has included a fattier pork belly, which I did not prefer. However, we were very happy to try McCann’s Vietnamese sandwich which included perfectly roasted pork, with chicken and pork pate, pickled daikon, shredded carrots, a spicy mayo, and crunchy jalapeños to top the sandwich and add a bit more heat (which I love… bring on some spice!) The roasted pork was tender and we absolutely loved the pickled daikon and shredded carrots. I could actually eat a bowl full of the toppings (hint hint): pickled daikon, shredded carrots, and jalapeños would be a perfect side dish or accompaniment to any sandwich! I was pleasantly happy with our choice! I am also excited that I found a banh mi sandwich that I could really enjoy as I have been intrigued by this Vietnamese sandwich and have been seeking to find one that I could indulge in! McCann’s – you have done it! For more information about McCann’s click here to see my previous February blog post! 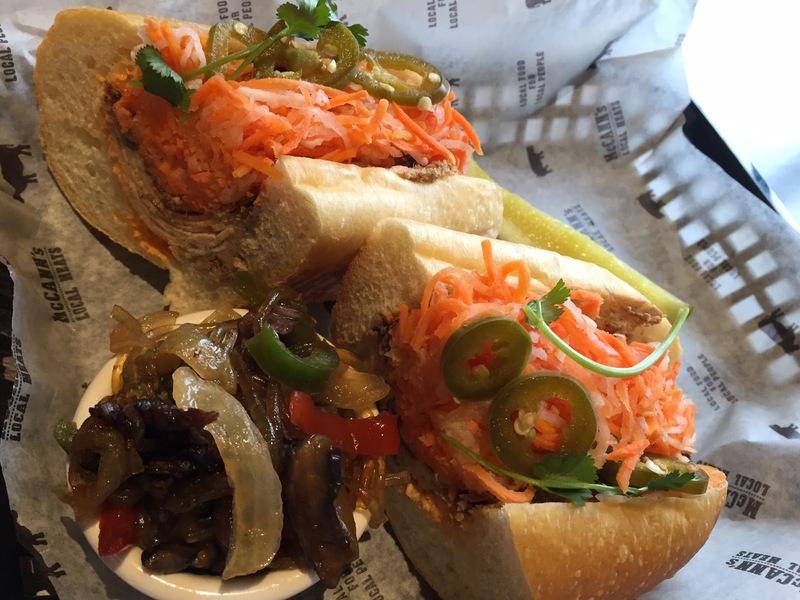 Also click here to see my post on my love of the bulgogi sandwich at McCann’s – one of the best sandwiches that I have ever had! With our tummies feeling warm and fuzzy, but still ready to take on the next course, what better way to celebrate then with a “palette cleanser”? Hedonist Artisan Ice Cream is one of our favorites…plus I needed a re-fill on my favorite non dairy chocolate sorbet (yes, score for me!). Hedonist Artisan Chocolate, located right next door, was first created in 2007. 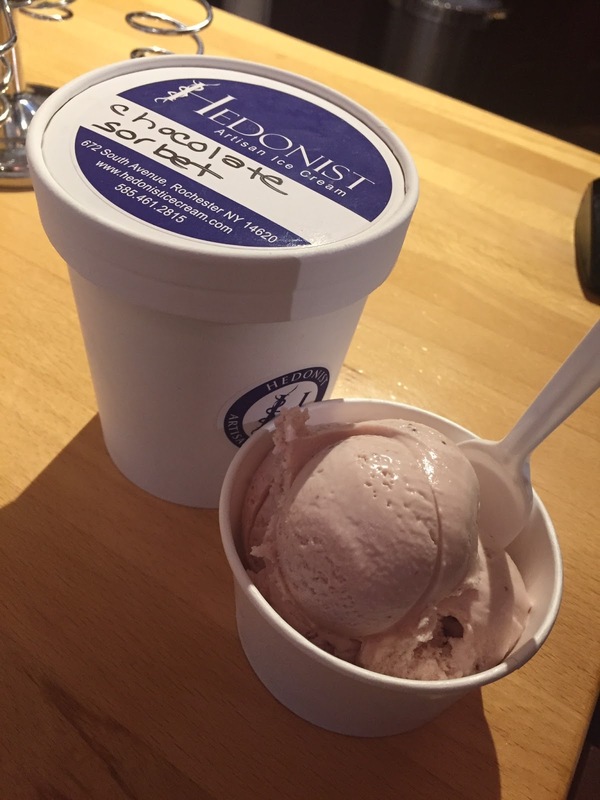 In 2013, Hedonist Artisan Ice Cream was created, making conscious decisions to source out local ingredients around Rochester, including Coffee Connection (Located right across the street! 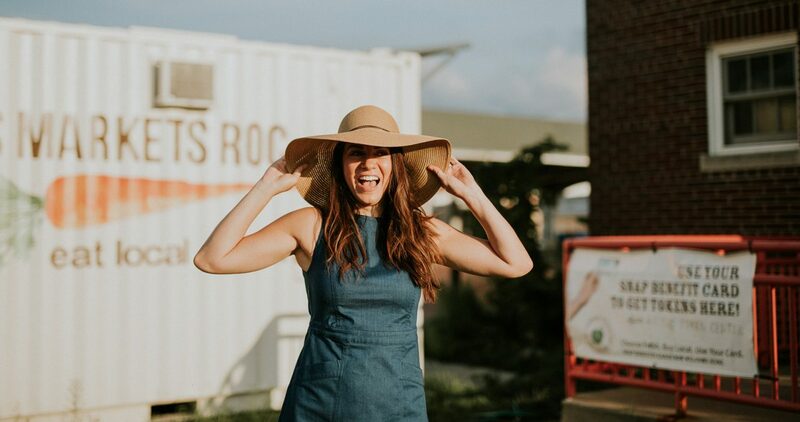 The Coffee Connections sells organic and provides employment for women who are recovering from addiction. ), Lively Run Goat Dairy, and Hurd Orchards. Their ice cream is made without artificial coloring or flavors, keeping the creamy homemade taste, with an eclectic palette of flavors. Hint Hint my friends: If you have any suggestions of future ice cream flavors and concoctions, they are always open to suggestions! Get your creativity on and suggest away to see the flavors that you are looking for! Also, stay on the lookout for future events. Hedonist Artisan Chocolates & Ice Cream puts on community events within the South Wedge. Keep in touch by going to their website, Instagram page (@hedonistchocolates), Facebook, or Twitter feed (@hedonistaic; @hedonistchoco). Valissa ordered the vanilla ice cream and I was ready to order the non-dairy chocolate sorbet (yes, even though I was taking a pint home! ), but the strawberry ice cream caught my eye. Now, I love that you can sample the many flavors before purchasing, so of course I sampled the strawberry. Well, it was love at first… taste…need I say more? We took our time savoring the flavors of our ice cream, scheming over where our next “food tour” will be! Then, with a pint of non-dairy chocolate sorbet in a freezer bag and 2 empty ice cream bowls, we were ready to head off to our last stop! Upper Crust Cakery/Glenn Edith Coffee Roasters has been getting a lot of recognition lately (and rightly so!) for both their coffee and their scrumptious desserts. Upper Crusty Cakery, owned by Julie McOrmond since its creation in 2006, was previously located in Penfield. John Ebel, long-time friend of Julie and owner of Pour Coffee Parlor and Glen Edith Coffee Roastery (On Somerton) agreed to welcome a glorious business partnership between the two. When these two businesses joined forces, it created a wave of support from many in Rochester. Julie’s passion for quality desserts and John’s passion for premium coffee have led to an inviting and addicting quality, which leads to our final course. Alas, coming to the end of our food tour, we were finishing up with a dessert. With macarons in mind, we quickly chose several flavors, including pistachio, raspberry, and hazelnut. 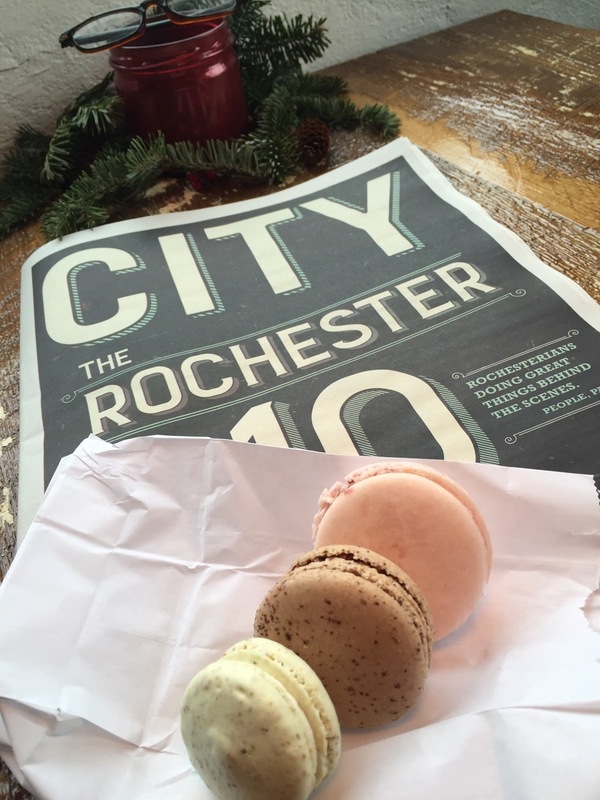 We took our time, chatting over the Rochester City Newspaper, and continuing to plan our next food tour event! I also wanted to take a cannoli home (as my husband loves cannolis), but sadly there were none left. Mission next time we visit: take home cannolis! I was able to meet Ryan, the coffee manager of Glenn Edith! His inviting personality, is quick to pick up on, as he roamed from table to table, talking with visiting customers. He clearly has a passion for his craft. For coffee lovers and dessert/pastry lovers alike, Upper Crust Cakery/Glenn Edith Coffee Roasters is a must stop visit! At the end of our course-by-course tasting tour, we jumped back into our car, ready to be warmed by the heat on the chilly day, happy as can be, feeling slightly full, but satisfied. We are excited for our next “food tour” in Rochester, which will be coming up within the next week! Look for a blog post coming out shortly after this to see where we tasted and what our theme was! *Note: All underlined and bolded restaurants/businesses are connected to a link. Just click on the link and it will bring you to each website! 283 Oxford Street 739 Clinton Ave S.
Hi Victor, glad you enjoyed it! I have another food tour blog post coming up! Stay tuned or sign up to be sure that you see it!